The Equine Insider was founded in 2014 as a way to provide horseback riders, horse owners, and horse lovers with insight into the latest products, news, and horse care tips. We’ll connect you to the latest styles, trends, and products in the horse world, and have fun doing it. You can also turn to us for informed reviews of tack, clothing, books, and horse care products. 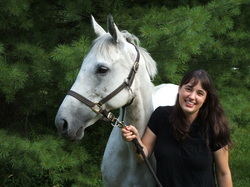 Paige Cerulli, founder of The Equine Insider, has been riding for 18 years. She shares her life with her 15-year-old Thoroughbred mare, Whisper, as well as with two crazy cats. Paige lives above a barn in the Berkshires where she boards Whisper. Whisper, an ex-racehorse with a serious sweet tooth, helps test samples for product reviews and also contributes her own thoughts towards reviews of horse treats.